Should You Set Up Facebook Instant Articles on Your Blog? If you’ve ever clicked on a slow-loading link on your phone, you’ll know how frustrating that is. Facebook are taking a stand on slow-loading websites on our behalf. Very soon, the algorithm will penalise posts linking to slow-loading sites for reach. They don’t want marketers giving their users anything but a very positive experience. Those that won’t will start seeing their ability to get their linked posts into newsfeeds decrease very soon. Now, this post isn’t about website hosting. Although, I have recently upgraded my own website hosting to SiteGround to increase the speed from what it was. You see, Facebook has introduced a solution to improve load speed, but ONLY for blog content. And ONLY for self-hosted WordPress blogs. If you publish blog posts on your website and post links to those blog posts on Facebook, then you MUST set up Instant Articles ASAP if you want your content to be visible to your Facebook audience! Introducing Facebook Instant Articles for WordPress. Instant Articles is the new native Facebook feature that opens your (WordPress) blog posts in an instantly loading browsing environment INSIDE Facebook – when the link is clicked by a user browsing Facebook on a MOBILE device. There’s no change to the desktop users’ experience for now, but when the link to the blog post is clicked from the Facebook mobile app, it loads instantly. If you’re viewing on a desktop, watch this video to see what you missed. 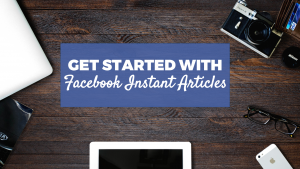 What are the benefits of setting up Facebook Instant Articles for you? #1: Increase your post reach. Facebook reward marketers who use their native features by giving your post extra ‘reach juice‘. If you’ve hosted Facebook Livestreams, you’ll have noticed that your posts get more views compared to pre-recorded videos uploaded to your page. When you’ve set up Instant Articles, your posts containing links to your blog posts will be rewarded by being placed in more newsfeeds. #2: Increase your blog post readership. More people view Facebook on a mobile app than on desktop. Your blog links will load instantly for mobile users so you won’t lose impatient readers who don’t want to wait for a page that is loading s-l-o-w-l-y. You’ll also bypass any ‘slow loading website penalties‘ when you share your blog posts, so more people will see and read your blog content. #3: Less faffing around with links in comments. Facebook want users to stay on their site, so any posts that attempt to take a user away from Facebook (to your website, for example) is penalised for reach. We have been getting around that by placing the link into the comments section instead of the post itself. Problem is, when that post is shared, the comments don’t go with it. Because Instant Articles open inside Facebook, you’re not sending mobile users away from Facebook when you share your blog links. Therefore, the link to your blog post can go into the main body of the Facebook post, not the comments. And, in the interests of balance, what are the downsides to Facebook Instant Articles? Firstly, when someone clicks on the link to read your blog post from Facebook, they’re taken to a browser environment inside Facebook – not your website. If you’ve got website traffic audiences set up to track who is visiting your website or reading specific blog posts, these audiences are still tracking as though the post was being read on your website. If you have a Call to Action at the end of your blog post inviting readers to opt-in to your lead magnet, or visit another page on your website, these will work as they should, too. But, what you’re losing is the “attention” on your website. When they’ve finished reading your blog post, they won’t have the opportunity to be distracted by other pages or links on your site. Or, you have fewer readers seeing your blog posts in their newsfeed and reading your content, but you hope those readers stick around on your site. Now, those people with fast-loading blog with massive volumes of traffic can ignore Facebook Instant Articles. You’ve already got the volume of eyeballs on your content, and you’re not going to penalised for a slow-loading site. But, I’m going to hazard a guess that you don’t fall into this category. The majority of people I speak to/work with (and me! ), do NOT get a “GOOD” result when you test your site with the Google PageSpeed Checker. If that’s you too, in order to attract more traffic to your blog from Facebook, you should set up Instant Articles ASAP. Behind the scenes, talk to your (or a) tech person about speeding up your website load time. Once you’ve improved your site’s load speed, you can always turn Instant Articles off later, by deleting the plugin and removing the code – a 5-minute job. You only need to set up Instant Articles ONCE, then all future blog posts will automatically be converted. I’ll be straight with you though. Setting up Instant Articles is NOT the easiest task to figure out. If you don’t consider yourself a tech whizz, skip the next section and go straight to the end of this post. I’ve got you covered. However, if you are comfortable with tech, follow these steps to set up Facebook Instant Articles on your Facebook page and website. #1: You MUST have a self-hosted WordPress blog. If your blog isn’t self-hosted on WordPress, you cannot currently access Instant Articles. As long as the URL to your blog site is NOT [username].wordpress.com, you’re good to go. If you’re not sure, ask me. #3: Log into your WordPress dashboard. Click on ‘Plugins‘ in the left hand side menu. #4: Install and activate the Instant Articles for Facebook plugin. Click ‘Add New’ and search for ‘Instant Articles’. Look for this plugin, click ‘Install Now’ and then ‘Activate’. #5: Edit the plugin settings to add your Facebook page ID and copyright info. You’ll find your Facebook page ID in your page’s About section. Copyright info will be your name or company name – owner of your articles’ copyright. #6: Connect your URL by adding the code Facebook give you to your website’s <head> </head> area. #7: Edit your Instant Articles style template to upload a logo (required), and customise fonts and colour schemes (optional). Your logo must be landscape orientation, in .png format, and a minimum size of 690px wide x 130px height. #8: Copy the Facebook markup code for 5x blog posts from your website and set up in Facebook as ‘Production Articles’. In your WordPress dashboard, go to ‘Posts‘ and click ‘edit’ underneath the first blog post you want to convert. Scroll down until you locate the Instant Articles markup code beneath the blog (wysiwyg) editor. Copy the markup code and paste into a new ‘Production Article‘ in Facebook. Repeat this process x4 with separate blog posts. #9: Preview your 5x Production Articles using the Pages Manager mobile app, to check they appear correctly. Open the Pages Manager app on your mobile device. Navigate to the 3 dots on the bottom right of the app. Locate ‘Instant Articles‘ and open each of your 5x articles to check you’re happy with their appearance. #10: Submit your first 5x Production Articles to Facebook for review. Go back to Facebook and click the blue “Submit for Review” button. #11: Wait 3-5 business days for Facebook to approve your initial articles. Receive notification that your articles have been approved. #12: Convert all previous blog posts to Instant Articles. New posts will be converted automatically. Repeat step #8 for each of your previously published blog posts that you want to convert into Instant Articles. Or, pay a VA or competent teenager to do it for you. And, that’s it. You’re all done. In future when you publish a new blog post on your website, the plugin will automatically convert your blog post into an Instant Article. It won’t automatically post your new blog from your page, though. You will still need to manually post or schedule the link on Facebook. But now, anytime someone clicks on your blog link via the mobile app, your blog post will load instantly! Is it wrong that I keep clicking my own links because I’m excited at how good they look and how fast they load?